Third non-crochet post in a row, sorry. I'm suffering from a bit of craft A.D.D. 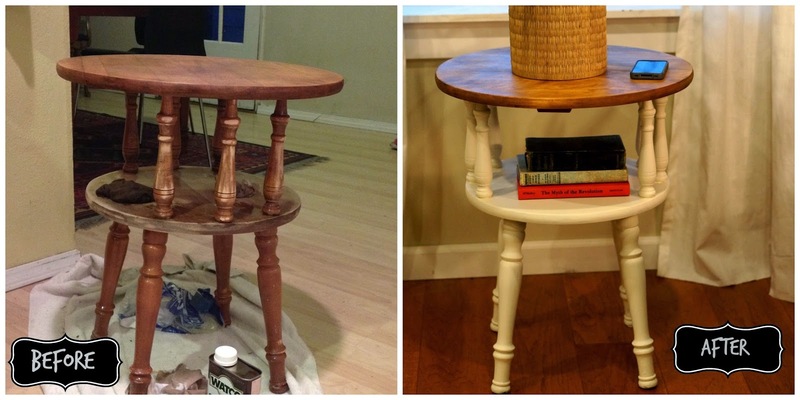 So I picked up a somewhat hideous side table from the thrift store for $8, and turned it into a pretty cute one! It didn't start off this cute. I forgot to take a full on before picture but here's what it looked like mid-way through the project. When I found it, the finish on it was yellow and peeling off. It was a thick high gloss peeling abomination. But I saw potential . . .
For the top I used our rotary sander and sanded off the finish down to the bare wood. I then finished it with Watco Danish Oil in medium walnut. I wish I had gone darker, but I'm still very happy with how it came out. I LOVE Danish Oil! So easy to use and it brings out the natural beauty of the wood. 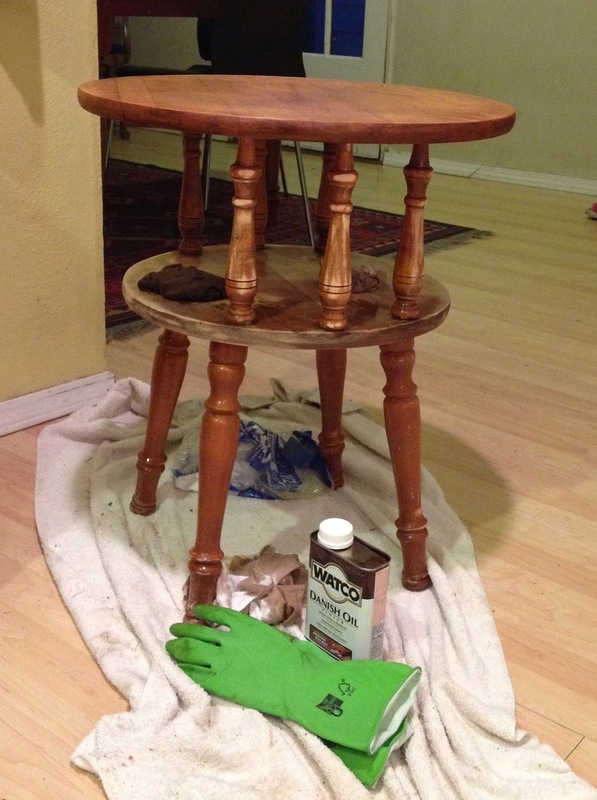 Now most furniture makeover blogs I've looked at like to stain first and then put on some soft furniture wax or a coat of poly. I'm a complete newbie here, but I was really impressed with how nice the Danish Oil finish came out and I cut out a step. Once you're done wiping on that oil, you're done. No top coat is needed. For the legs, sanding just wasn't cutting it, I would have had to spend three weeks getting ever nook and cranny on those legs. So then I tried Citristrip and it literally did NOTHING to the finish whatsoever (must not work on this particular finish). Next I tried a super chemically smelling "furniture refnisher" that actually was working, but because of the smell I had to work outside. Unfortunately it was freezing and I felt like my fingers were going to fall off so I decided to paint the bottom with DIY chalk paint. I used 1 part Plaster of Paris with 6 parts off white paint (Miller Little Dove) and a teaspoon of water and mixed it in a rinsed out Starbucks cup. I used 3 coats. When I was finished painting I just threw the cup away. Easy to the peasy. The paint turned out so great! I love the chalky matte finish. It looks really professional. I love my new side table!! !